Tommie Smith is best known as a world class sprinter and for protesting (along with John Carlos) U.S. racism and human oppression on the winner’s podium at the 1968 Summer Olympics in Mexico City. Smith was born in Clarksville, Texas, and raised in Lemoore, California. His family worked as field laborers. In 1963, Smith became a student-athlete at San Jose State University (SJS) to escape picking cotton and grapes for a living. While there he emerged as a world-class sprinter and concurrent record holder in eleven track and field events. Smith also became politically active, beginning with a sixty mile sympathy march from San Jose to San Francisco for the southern civil rights movement on March 13 and 14, 1965. At SJS, Smith’s activism was fueled by racial inequities in housing, employment, campus social life, and the school’s academics. Black student athletes, for example, were directed away from the sciences and humanities and funneled into the physical education curriculum that kept them eligible to compete in intercollegiate sports. This practice often made their graduation improbable. Tired of this treatment and inspired by SJS Sociology Professor Harry Edwards, Smith joined SJS’s United Black Students for Action (UBSA) on September 18, 1967. The UBSA initiated a campaign against racism at SJS which led to the cancellation of the school’s opening football game with the University of Texas at El Paso, because of the threat of race violence in that area. This activism quickly moved beyond San Jose State as some black athletes who were preparing to compete in the 1968 Summer Olympics created the Olympic Project for Human Rights (OPHR). The OPHR threatened a boycott of the Olympic Games unless the issues facing black people across the nation were resolved. Although the boycott never occurred, Smith looked for an opportunity at the Olympic Games to protest racial injustice in the U.S. That opportunity came when Smith won the Gold Medal for the 200-meter dash. 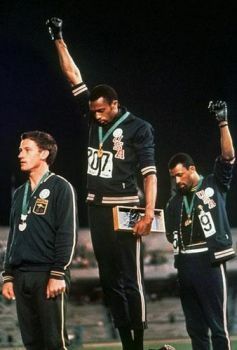 During the victory ceremony, he and John Carlos (who won the Bronze Medal), mounted the podium and defiantly raised black-gloved clinched-fist salutes. In the aftermath of their protest Smith and Carlos were temporarily banned from amateur athletics. Smith, however eventually went on to a career in athletics and academics. After graduating from San Jose State in 1968, he played wide receiver for the Cincinnati Bengals in the National Football League, coached track at Oberlin College in Ohio, and in 1978 became the track and field coach at Santa Monica College in California. Tommie Smith was inducted into the National Track and Field Hall of Fame in 1978 and the California Black Sports Hall of Fame in 1996. He also received the Arthur Ashe Award for Courage (2008). Finally, in 2005 a statue was erected in honor of Smith (and Carlos) at SJS. Tommie Smith, Silent Gesture: The Autobiography of Tommie Smith (Philadelphia: Temple University Press, 2007); “Silent Gesture" Still Speaks Volumes” (URL: http://www.cbsnews.com/stories/2007/02/08/earlyshow/leisure/books/main2446168.shtml).